Beading Arts: Tammy Powley: Is it better in the Bahamas? A couple of years ago, Tammy Powley took a cruise to the Bahamas from her (already paradise) hometown in Florida. She shared about the adventure and made a very funny list of likes and dislikes that I think you should definitely check out. Just click the link above! 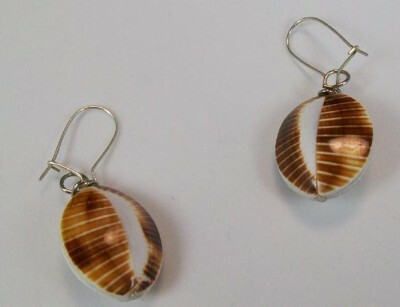 Tammy found only a few handcrafted items that she ended up buying, like the shell earrings above, but there was something that ended up inspiring a project of her own later...the money! 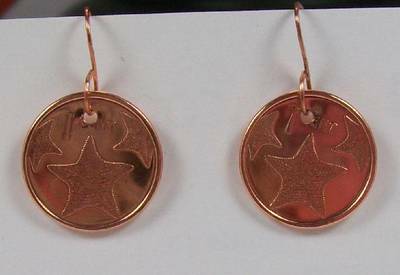 Tammy made these cute earrings and posted a tutorial about it on her About.com Jewelry making site. So next time you decide to go traveling, keep a couple of pennies at the end for a wearable souvenir! Thanks for including me in your series, Cyndi! 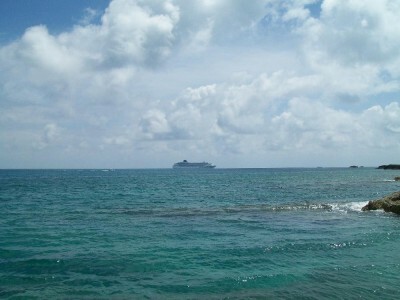 I went to the Bahamas, to Paradise Island, when I was in high school. It was a magical place! Ohmygoodness, I would so love to see you with a flock of flamingos!! I'm inspired! I have some pressed pennies I brought back from Sea World a few years ago. You know those machines where you pay a quarter to put a penny through this press? Thanks for sharing Tammy's ideas. I love this series you are doing. Tammy's earrings are great - now I'm getting all kinds of ideas! That really is a terrific idea! You would definitely remember that vacation.